The Irish claim that I am the oldest breed of dog known to man, but the first public introduction of the Irish Terrier was at a pedigree-only dog show in Dublin in 1872. I was developed to be a ratter and a guard dog, and I do both extremely well, if I do say so myself. If you don�t have rats, I can just double up on my talents for guarding. I am also known to be a pretty good retriever, if you like to hunt. I am versatile, with lots of energy to spare. My coat is hard and wiry with a soft undercoat. Hand stripping is usual for show dogs, but a little clipping here and there will do nicely if I am to be a pet. When fully grown, I am about 18 inches tall (45.7 centimeters) and I weigh between 25 and 27 pounds (11.3 to 12.2 kilograms). We have no Irish Terrier Breeders listed at this time. 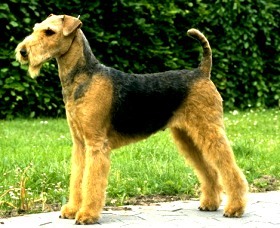 Click here to place your Irish Terrier Ad!